Don’t forget that my Tuesday evening sketchbook workshops start at lovely Alston Hall in the Ribble Valley on the 14th April! Join me over a convivial glass and discover the creative possibilities around you through sketching on location. For all levels of ability, this course of six lively workshops will encourage your self-expression and help you to record your visual memories in a highly personal, vivid way. Keeping a sketchbook can change your view of the world, bringing a new appreciation of your surroundings, whether they be grand and impressive or humble and everyday. Opening Sunday 2nd November at 2pm. Venue : Stockport Art Gallery and War Memorial. Dates : Tuesday 4th November to Tuesday 16th December 2014.
workplace as they prepared songs for their most recent album. whatever she feels will suit the subject. Falmouth, and London’s Central St. Martins. including a book jacket for the Spanish translation of Iris Murdoch’s ‘Henry and Cato’. through places like the Cornerhouse in Manchester. Award for a drawing made of her mother in hospital. sheets of paper from the nurses. James Hobbs – Artist, author of ‘Sketch your World’, and freelance journalist. Comment	Exhibition : Caroline Johnson : Northern Routes. Mill Chimney with Distant Fells, Rossendale. For some time now I’ve been involved with The Whitaker Museum and Art Gallery in Rawtenstall, to the North of Manchester. And in case you didn’t already know, this post-industrial area is known as The Rossendale Valley, characterised by the steep sided valley of the River Irwell and its tributaries which cut through the high moorland of the Rossendale Hills. In the valley bottom, urban settlements grew up at river crossing points between Rawtenstall and Bacup. Textile mills and chimneys and gritstone terraced houses are the dominant buildings and roads are concentrated in the narrow valley. There’s a striking contrast between the forbidding mill towns and the sunlit heights which form their backdrop. We have such a wealth of subject matter for the sketching workshops I’m giving at the museum (Thursday evenings, with wine, other beverages available!) ( nb we’re currently discussing another batch of sketching workshops, this post was originally published in June- if you’d like to be involved get in touch with the Whitaker ) and for The Big Draw, which took place late last year.. The museum’s in a Victorian mansion with lovely views over the surrounding park and town, towards the fells. Inside, there’s an eclectic collection of objects, including stuffed animals- some quite frightening- and birds, and an excellent café. Everything you could ever need for a few hours spent happily sketching or not, and with refreshments to hand! Comment	Into The Valley, Rossendale. 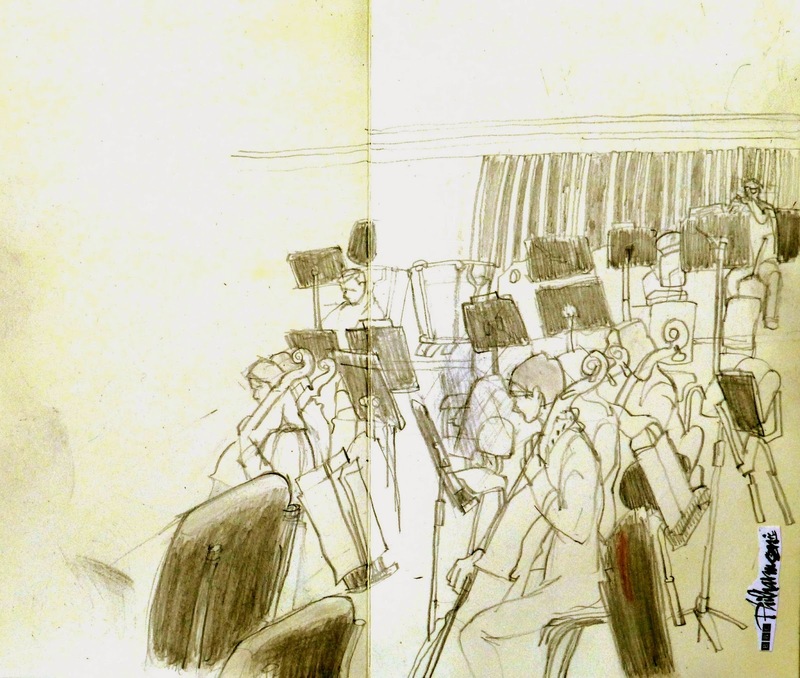 I was pleased to have the opportunity to sketch this orchestra over a couple of days. Their publicity department had used my picture of Ordsall Hall, where they’re playing this very week, so I made a deal to sit in on rehearsals. They’re based in Media City UK on the banks of the Manchester Ship Canal in Salford. The BBC’s move marked a large-scale decentralisation from London, and the North of England has profited from this. From the top floor of the building we could just about see Coronation Street’s factory wall- what a thrill! It took at least the first morning’s drawing to feel comfortable, and to have some sense of the direction or focus my work might take. Because this was a rehearsal, the music would start and then suddenly stop and the conductor would gently encourage the musicians in a mixture of English and Italian. This was a bit distracting at first, and the longer pieces of music encouraged inspiration and a better flow to the pencil. 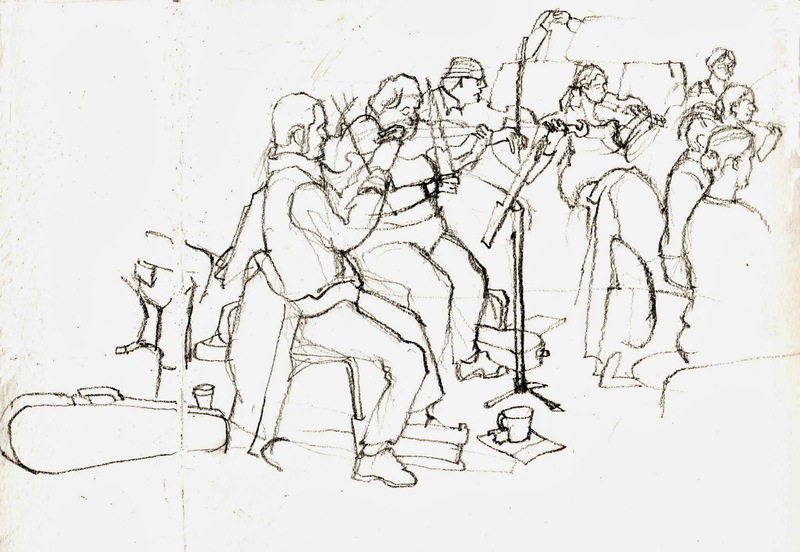 The musicians were a nice bunch, interested in what we were doing, as we were in them- we’re all artists, aren’t we?! I used my sketches in the studio later, along with photographs, to produce a larger work, below. This is one of the traditional uses of the sketchbook.. as Fine Art students we were we were encouraged to use them for various purposes: as preliminary drawings prior to painting; to explore new ideas, thus developing creativity; as visual diaries of the external world and as drawing practise, and to re-visit as source material for inspiration. Our books were untidy, experimental, fearless and anarchic. I’d like to get back to that level of ‘insouciance’ -it’s so easy to blinker oneself by worrying about a good result on the page to be shown to others, rather than opening up to new approaches and unfamiliar materials. Let’s not be hampered by the fear of failure! Hacienda Canvas Print now available. Caroline is collaborating with Manchester Printers Big Exposure Print to make available a canvas print of her popular Hacienda picture. Canvas size 67 x 100 cm, ‘The Hacienda, Whitworth St, Manchester’ is reproduced using lightfast inks from the original artwork. Comment	Hacienda Canvas Print now available. Caroline has been shortlisted in the Guardian Witness Awards 2014 Human Interest category for a sketch and description she made of her mum waiting on a hospital trolley. Follow the link below to see the original post. With the announcement of new material from Elbow, I thought it’d be a good time to revisit the drawings I made during a week long residency at Blueprint Studios, Salford. This is where the band rehearse and indeed were starting to record material destined for the new album. I was made very welcome (the band apologised for disturbing me!) and their management have kindly allowed me to make available a limited number of prints of four of the drawings I did in ‘The Big Room’, for sale. If you’d like to buy signed prints, or the original drawings, contact me via the contact form. Sketch Your World by James Hobbs is published this month January 2014 in the UK (Apple Press), the US (North Light) and Asia (Page One). It features a number of Caroline’s sketches and drawings. What is it about? It’s about putting a sketchbook in your pocket, going places, whether it is the journey of a lifetime or to the dentist, and then getting the sketchbook out and drawing in it. (Or maybe not a sketchbook, but a smartphone or tablet, because the book includes a section on this, too.) Drawings by around 60 of my favourite international artists shed light on how they go about things, whether the drawings are small, large, in colour, of architecture, parks, people, in cafes, trains or waiting rooms, in war zones and political demonstrations, or in the middle of the night. It has around 300 images in it. That’s what it’s about. TOWN: Exhibition at Stockport Art Gallery. Caroline Johnson is one of the artists featured in ‘TOWN’ a new exhibition curated by Pop Up Gallery Manchester, showing at Stockport Art Gallery from Friday 11th October until 10 November 2013. Comment	TOWN: Exhibition at Stockport Art Gallery.